SME offers special training programs for students, and other Industry person. These training program, are specially customized, and tailor, made for person to person. 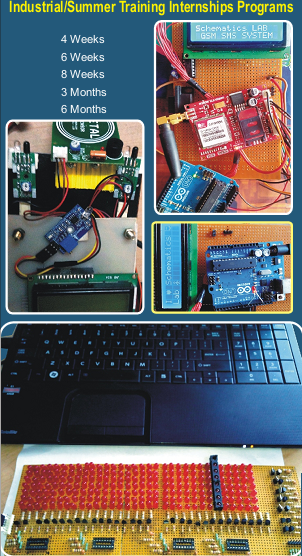 Robotics & Embedded System with 8051, Atmel AVR Series (Mega & XMega), Arduino & ARM. Sensor network (Matel, Moisture, Soil Moisture, LPG, Alcohol, Motion, MIC, Biometric,Potentiometer, Accelerometer/ MIMS (2 Axis / 3 Axis) etc. ), Heart Beat, Temperature, Fire & Alarming Sensor etc. Wireless (GSM, Bluetooth, RF Module (433 / 2.4 GHz), RFID, Wi-Fi, Zig-Bee,Bluetooth, IRDA, XBee, NEC Protoco, RC5 Protocol. Special Training on PCB Design. Proteus ISIS Professional / Lab view/ AVR Studio Professional software. 100% Hand-on Practical Training Program. 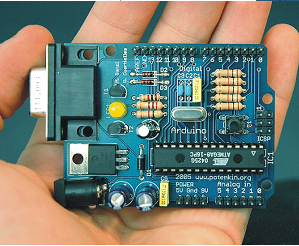 Introduction to Embedded system and present & future of embedded system. Introduction to Microcontroller Unit (MCU) & Embedded Processors, Overview of the MCU Family, Criteria of choosing MCU & Difference between them etc. Study of MCU Architecture, Programming & Simulation in Embedded C, Bus design used for program & Data Memory, Instruction Set and complexity, General purpose registers, Program counter & Program ROM space in the area, RISC Architecture in AVR, Various and register & memory with AVR Studio Professional. & DC motor control, SPI Practical & MAX 7221 / 232 Display interfacing, TWI between Controllers, Serial Interfacing with PC, Hardware circuit Description for interfacing of various I/O Devices With MCU. Data times & Time delays in C, I/O programming in C, Logical operator / operation programming, Data serialization, Memory Allocation, Hex file & Hex function, Timer / Counter programming, Interrupt programming, Port Programming, I2C Protocol Programming, SPI Protocol & DS1307 SRTC (Serial Real Time Clock) Interfacing Programming etc. using AVR Studio Professional. ASIC, SPI & I2C Protocol. Introduction of OS, Kemels, Device and RTOS, task, states, Process, inter process communication semaphore, Scheduling Algorithms, OS1307 (serial Real time Clock) etc.